York Minster, North Yorkshire. – Lonely World Photography. We visited York for 2 days over Easter this year and took the opportunity to take some fantastic photographs of the town and York Minster. York Minster is one of the finest medieval buildings in Europe and its full name being the Cathedral and Metropolitical church of St Peter’s of York. It was built over 250 years ago between 1220 and 1472. 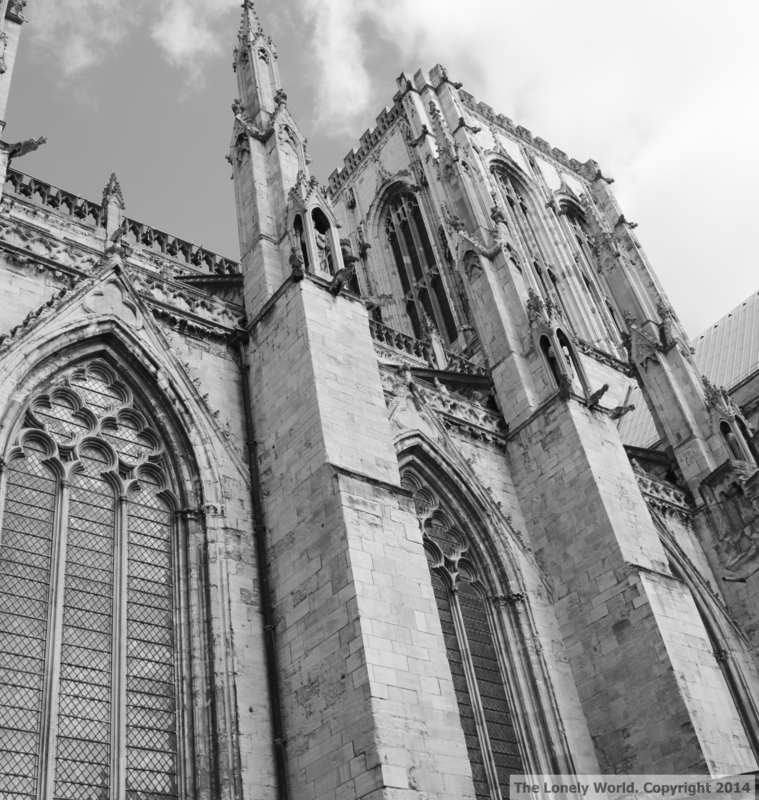 It has a hugely important heritage to the city of York with the remains of Basilica, the ceremonial centre of the Roman fortress discovered beneath the grounds of the Minster. 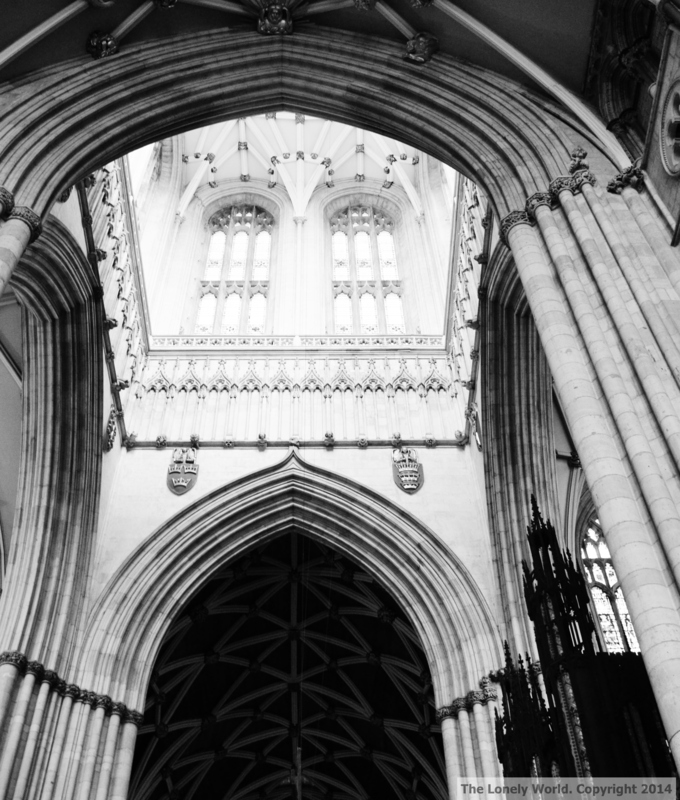 On July the 9th 1984 a fire believed to have been started by a lightning strike to the Cathedral destroyed most of the roof in the south transept and took over four years to complete the repairs. 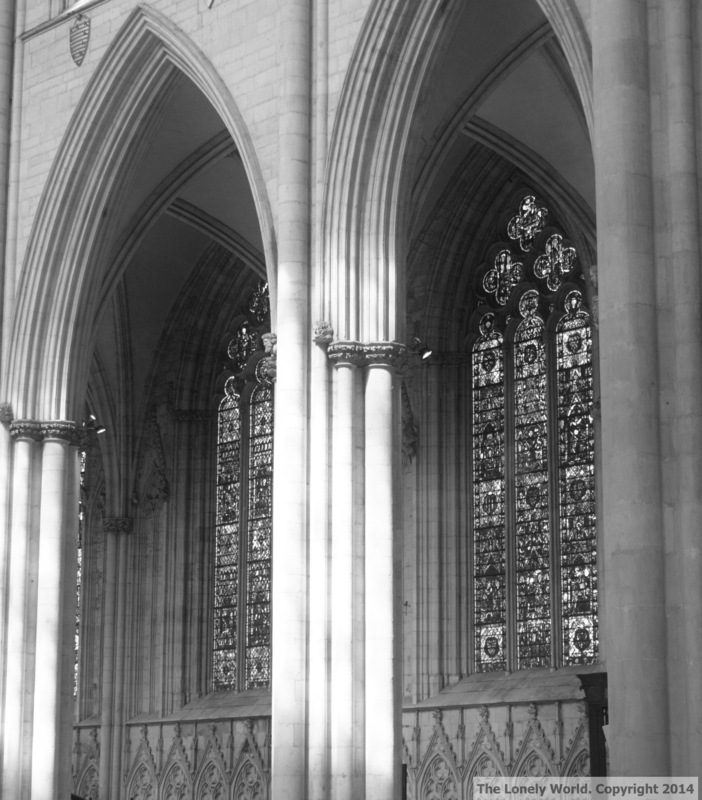 We decided to edit them in black and white to try and capture the gothic type atmosphere that surrounds the Minster and to give a sense of the haunting but grand building and its beautiful features. I took this shot outside the main entrance in to the Cathedral looking directly up at the building. We were blown away by the sheer intricate detail that had being painstakingly carved into the stonework and features of the building as well as all of the exterior mouldings.The panel stained glass windows are visible in this shot along with the grand circular window at the top of the building. 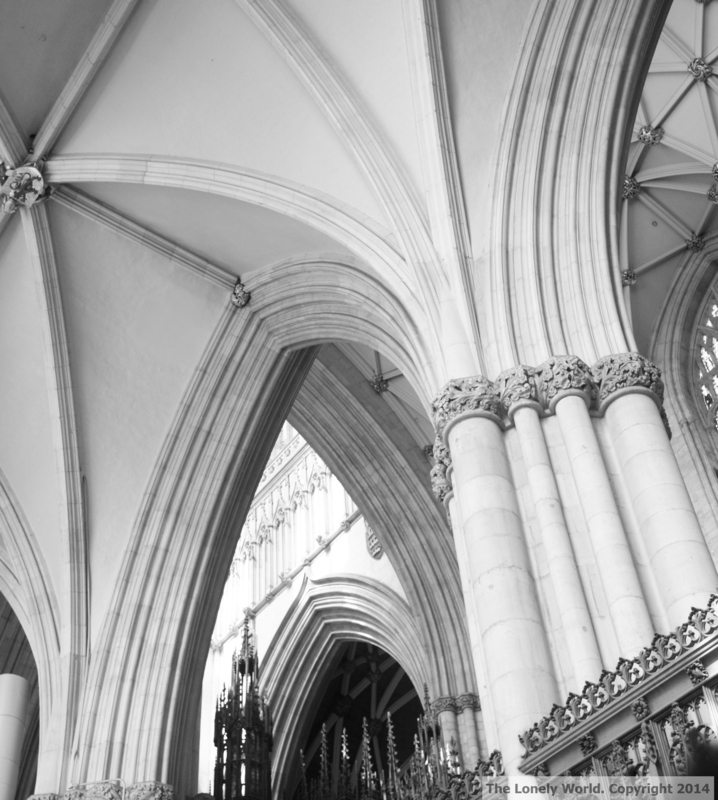 This photo was taken in the main hall of York minster, I tried to get as much of the ceiling in without actually lying on the floor and getting trampled on by hundreds of tourists. We visited on Good Friday and they were holding various Easter services inside the Minster, this created a lovely atmosphere and although I’m not religious it was still moving to be at that place at that time. Another shot of the ceiling and arch ways inside the corridors of the Minster. The moulding on the ceiling are continuous throughout the building and have been finished to an extravagant standard with a lot of the smaller feature mouldings finished in gold. I absolutely adore this photo and would love to say I had taken it but unfortunately it was the fine work of M. He seems to have a good eye for detail that I usually miss and is able to picture things as a shot before he even picks a camera up. It was originally shot in colour but I have edited to fit in with this collection of photographs. 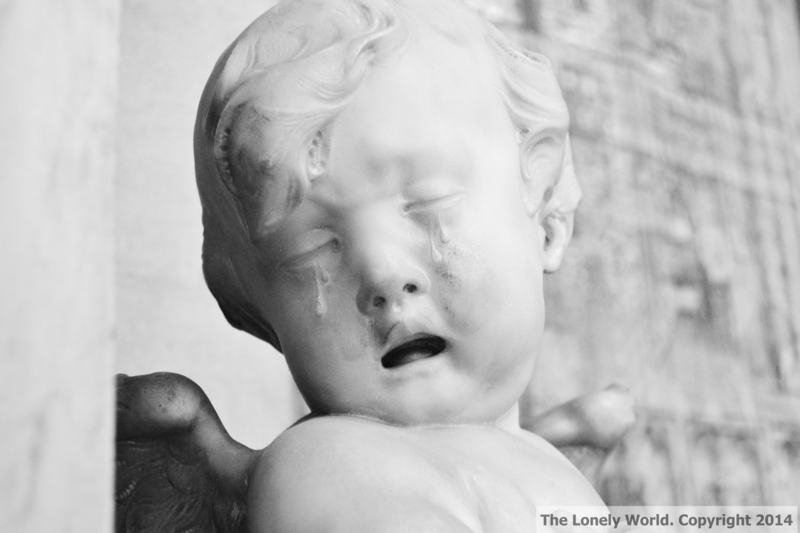 There are various statues around the Cathedral, this one of a crying cherub was a beautiful choice on M’s part. Finally another one of my shot of some of the panel stained glass windows, these are prominent through out and add to the complete grandeur and beauty of the Minster. The fantastic and breath taking detail covers absolutely every inch of the interior and its hard not to be blown away by the scale of it. < Sunrise at Blackthorn Farm, Anglesey.